Thriving for a self-sustainable lifestyle. Donald Johnson wrote: That plant is still useful for removing certain types of soil contamination, as well as making rope, and waterproof resins. As for the legalities, it could definitely cause problems in a lot of places. It's probably already a widespread native plant already, since it likely first sprouted Somewhere in the western Himalaya mountain ranges. Anyways, my black raspberries are growing and will be ready for a harvest in the next couple weeks. Have you successfully sprouted any seeds from the mail? If so, how where they packed and shipped to you? No, I haven't been successful in sprouting any. Instead, like I said I will try to stratify them in the fridge. The fruit was allowed to dry on the plant and then sent to me in regular post envelope. Donald Johnson wrote: Congratulations on a new sprout! I live in Pittsburgh (US) where these plants are native and grow wild. As a food resource these patches must be maintained and taken care of to keep up production. Unmanaged berry patches turn into thick thorny patches that are very difficult to manage or maintain, that will need cut to ground level to be properly set-up. These are highly invasive plants, and can easily take over forests, any disturbed soil and turn them into unmanageable thorn beds. With all that being said, these are my favorite types of fruit, and they are a wonderful addition to any garden or maintained environment. I have a wild black raspberries patch that established in my parent's back yard that I started tending recently. I'll be happy to mail some seeds to you if they actually produce good fruit. Good luck getting your berry patch set-up! Hmm. Sadly, that sprout wasn't berry even though it has a striking resemblance to berry leaves. Instead it was a weed, what is commonly known as Marijuana. I was so devastated to discover that I just didn't feel like posting here. I would love to try your seeds, may be they will do better. Should I send my postal address? Meanwhile, I have planned to put the previous seeds in Refrigerator for a month or two for stratification process. Hopefully, that will make them sprout. When everyone says that these things are wild, I think that the only problem should be getting them to sprout/germinate, afterwards it should do fine on its own. Steve Farmer wrote: Disclaimer: I'm not massively experienced in growing olives and only have young trees from nursery and planted out fairly recently. What I have found in my limited experience is that olive trees smaller than those in your photos already have root systems that would be suited to pots bigger than the ones you have. Can you get bigger pots? or maybe trim some of the foliage and buds. It might be a choice between 100 flowers that don't result in olives, or removing 80 of them so that the remaining 20 do. Hmm. This makes sense. Unfortunately though, almost all of the flowers are dead already. While they do need pruning, I intend to purchase some land as soon as possible (God-willing). Hans Quistorff wrote: Be patient, they have very hard seed coats, designed to pass through bird digestion. I'm quite excited to report that one (1) BoysenBerry seed has sprouted. In fact, it germinated a week ago, but I got the time today to report. And in accordance with the theory that berry seeds are designed to be abused, I should mention that when I received the seeds BoysenBerry's pack was already open and roaming freely in the main envelope. They were possibly opened by the custom or other inspection department. But my point is that there abuse was started long before they reached me. And it's the only one that has sprouted so far. There's another thing growing as well, I'm not sure if it's a weed or something useful. Hmm. That's why I used the warm water water and vinegar. Will keep watering them twice a day to aid smooth germination. Anne Miller wrote: Maybe the trees are not old enough to produce fruit? Olive trees do need a certain amount of cold, however. Proper flower development depends on the climate dipping to 45 °F (7 °C) or below, although this number alternates with olive tree varieties. This is why cultivation is extremely difficult in the tropics or very warm areas. Make sure that bloom season is fairly dry and moderate. Bloom season (April to June) should be fairly dry and not excessively warm. Olives are wind-pollinated, so wet conditions can hamper a tree's fruit set. Full sun, without any shade blocking your trees, is ideal. Any area you choose should at least get some direct sunlight for at least six hours a day. 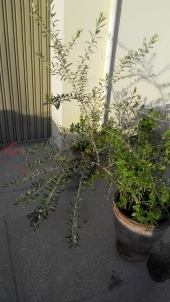 Very shady areas are not recommended for growing olives. Wait several years for your trees to start bearing fruit. Well-watered trees will start bearing fruit two or three times faster than dry-farmed trees. While some cultivars begin bearing fruit as soon as two or three years if properly maintained, many trees won't start bearing until 10 years old. When growing olives, remember this is a long term project. Start watching for fruit after the first two years, but keep in mind it may take much longer for an olive tree to yield fruit. Hmmm. I guess then the temperature seems to be the problem then. It does get too hot here in the summers. But not in the April, or earlier May though. Rains are frequent as well, but can keep it dry for a while. But then again Italy is too warm as well and humid too, I believe. How come they grow so many olives. Same goes for Spain. As for the sun, last year, I kept them in shade. However, they grew several extra leaves and seemed healthy. Are you certain about full sun? Let's see how it goes. I have my fingers crossed, the buds look promising to me. Hans Quistorff wrote: 4 types of berry seeds wil be mailed tomorrow. They are all seeds that dried on the vine at the end of the growing season. Plant them in moist soil and see what will grow. Today, I sowed 3 out of 4 berries you sent me. Fingers are crossed. I soaked the seeds overnight in warm-to-hot water with some vinegar (Acetic Acid). Used a little extra manure than usual, in order to decrease the pH. Plant 1 is the biggest. Plant 2 and Plant 3 are roughly equal in size. All three of them have buds developing on what I believe are the oldest twigs/branches. David Livingston wrote: Difficult with outmore info. Whats the weather like? particularly frost ? Are all these trees the same type of olive ? Are they self compatable ? How big are the pots ? How old are the plants? Weather is getting warmer. I'm in Islamabad, Pakistan. The conditions are favorable towards Olive Plantation, so much so that even the government is promoting. In fact, I got these plants through that scheme. They are of the same variety. And have grown ample foliage since I got them roughly 2 years ago. One out of three is in a larger pot so has more green than the other two. But overall, they are all doing fine. However, size of new leaves is slightly smaller than the old ones. Secondly, only the branches that are at least a year old have developed the buds. The new branches are only growing more branches and/or leaves but no buds. Which is sort of a good sign. I mean, I read somewhere that this is what olives do. I will try to send some pictures tomorrow. I have three (3) olive plants growing in pots/containers. All of them have started developing some flower buds which will eventually (hopefully, God-willing) become olives. This also happened last year, and flowers bloomed too, I guess but then died or fell off the plant. So no olives. Any tips from experienced growers to keep those flowers from falling off? I prefer organic ways like if needs more potassium then I can use banana peels or egg shells in case of calcium deficiency, etc.